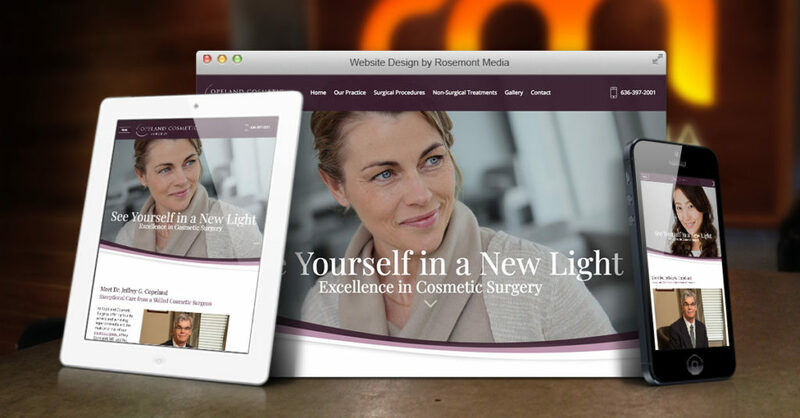 After many years with the same tried and true website, Dr. Jeffrey Copeland—a board-certified plastic surgeon in St. Peters, MO—decided to fully upgrade to a state-of-the-art responsive website design that meets the demands of today’s web-savvy plastic surgery patient. The responsive format adjusts to fit and function on a variety of mobile and stationary web-connected devices so that potential patients using smartphones, tablets, laptops, and/or desktop computers can easily browse the website. A sophisticated plum and purple color palette brings the elegant design, imagery, and navigation to life, while establishing refreshed visual branding for the practice’s online presence. For web users who are curious about Copeland Cosmetic Surgery and the aesthetic procedures offered for the breasts, body, face, and skin, informative custom content and medical SEO work together to deliver the answers they seek. Since Dr. Copeland’s incredible work speaks for itself, the website features a well-organized before-and-after photo gallery that is simple to update when new images are ready to add. Dr. Copeland and his team are enthusiastic about the transformation the website has undergone, and look forward to seeing how its enhanced performance benefits patients and the practice. For an example of the creativity and innovation that sets Rosemont Media’s websites apart, please visit www.copelandcosmeticsurgery.com.